The Villa Verona collection of interior lighting functions handsomely styled ironwork total with scrolling information. 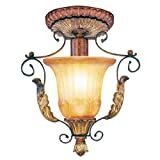 This semi flush mount features a verona bronze finish with aged gold leaf accents and rustic art glass. Show informal, conventional type with this lovely fixture.